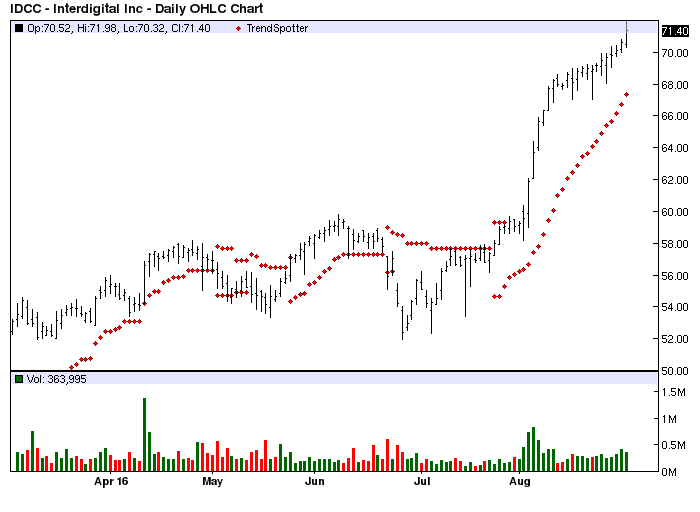 The Chart of the Day belongs to InterDigital (IDCC) I found the wireless equipment stock by using Barchart to sort the New High list first for the most frequent number of new high in the last month, then again for technical buy signals of 80% or better. Since the Trend Spotter signaled a buy on 7/25 the stock gained 23.23%. InterDigital Communications develops and markets advanced digital wireless telecommunications systems using proprietary technologies for voice and data communications and has developed an extensive patent portfolio related to those technologies.